If the bugs come back, so do we. 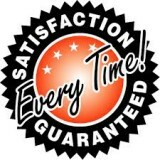 All of our service plans come with a full guarantee. That means that if you see any bugs or pests between visits, we’ll come back to treat your property at no cost to you. Most of our customers live pest free, but just in case you experience issues between services, you can have peace of mind that we’ll be there to take care of the issues.